"Three Billy Goats Gruff (Norwegian: De tre bukkene Bruse) is a famous traditional fairy tale of Norwegian origin, in which three goats cross a bridge, under which is a fearsome troll who tries to prevent them from crossing it. 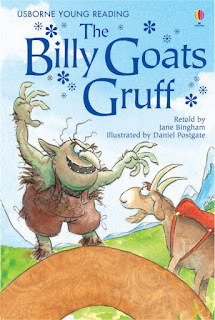 Three Billy Goats Gruff is an "eat-me-when-I'm-fatter" tale." 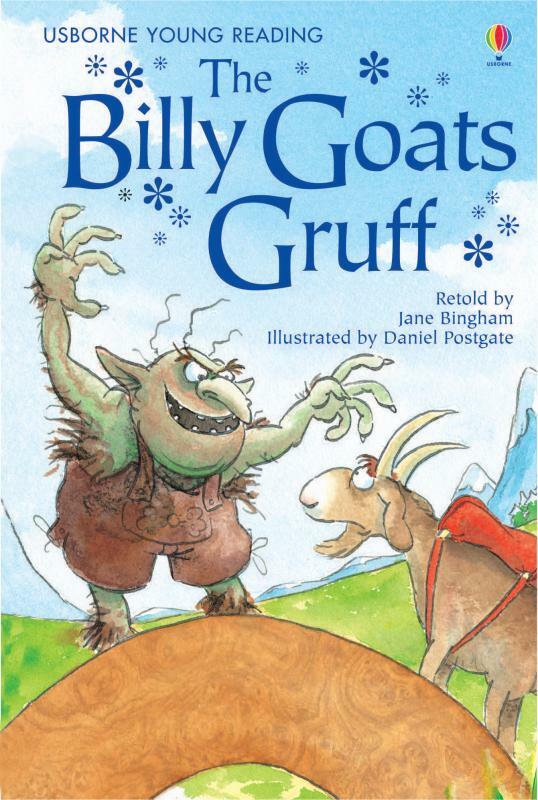 The story introduces three male goats named Gruff of varying size and age, sometimes identified in the story as youngster, father and grandfather, but more often they are described as brothers. There is no grass left for them nearest where they live, so they must cross a river to go a "sæter" (a summer farm in the hills) "to make themselves fat", but the only way across is by a bridge and it is guarded by a fearsome troll who eats any who pass that way. The youngest goat, knowing nothing of this, crosses the bridge and is threatened by the troll but is spared when he tells the troll that his brothers are larger and more gratifying as a feast. The middle goat sees that the youngest one has crossed and reaches the conclusion that the bridge must be safe after all, but when he crosses and the troll challenges him, he too tells him of his eldest brother. When the eldest and largest of them attempts to cross, the troll comes out to seize him but is gored by his horns and knocked into the river. From that time on the bridge is safe, and all three goats are able to go to the rich fields around the summer farm in the hills. The tale is, essentially, a tale of mind over matter and good against evil. The first two goats save their own lives by using their wits. It could also be said they act somewhat rashly and carelessly in the first place by crossing paths with a troll and then afterwards by putting their eldest brother at risk by telling the troll to wait for him instead. Ultimately, the eldest goat, who is older, stronger and more intelligent than both the younger goats and the troll, comes out as the story's hero. Another perspective is that the protagonist is the troll and that the moral is to accept a good deal, rather than to wait for a better one."